Our main goal is to provide the most comprehensive freight directory service available globally, connecting service providers to importers and exporters. This would also narrow down the search to connect the industry world wide. We decided to make the search as user-friendly and swift as possible, locating the company the browser is searching for. The clean site design offers speed and simplicity We have kept the design simple and concentrated on the contents of the directory. 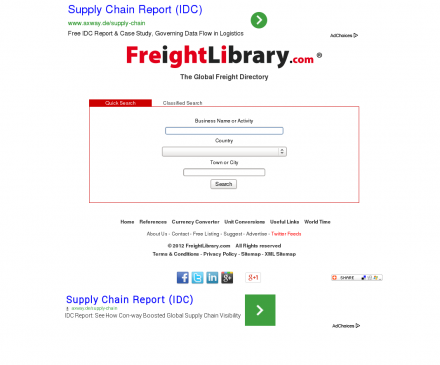 Description: The global freight directory. Comprehensive directory for freight and logistics providers worldwide with full contact details of airlines, shipping lines, freight forwarders, couriers, express operators, cargo agents, clearing agents, insurance companies and more. Marine Push Pull Cable, Control Box, Steering System. (Popularity: ): Supply Marine Push Pull Cable, Control Box, Steering System. Nationwide Auto Transport (Popularity: ): Professional licensed and bonded auto transporters. Utilize our car shipping directory and get free quotes.